The first Friday in the New Year is the Feast of the Epiphany, Jan 6, 2017. There will be a Solemn Mass offered at St Stephen at 6:30pm. It's not too late to start this pious novena to the Magi in anticipation of the Epiphany. This Novena is especially prayed beginning on 28 December (the Feast of the Holy Innocents) and ending on 5 January (the Vigil of the Epiphany). Please let us know if there are any additional Latin Masses in the area. Please join the St. John Berchmans altar servers ministry for the 8th annual Advent Rorate Candlelight Latin Low Mass in honour of our Blessed Mother. This Tuesday, December 6 at 7am. Voce Caelestes of Padre Pio Academy will sing. We are hoping you can attend. Please invite all your friends and family. It may be the Second Sunday of Advent, but December 4 is the feast St Barbara. This article by Professor Carol tells of the wonderful history of St Barbara and a particularly beautiful tradition that families can enjoy this Advent season. Click the link to read the full article. But here's the beginning excerpt. Here’s a simple tradition for Saint Barbara’s Day, December 4. Since it falls on Sunday this year, we will look at it one day in advance. Cut branches from a tree that buds in the spring. Ideal are twigs from cherry, plum, apple, or horse chestnut trees, as well as forsythia, lilac, English hawthorn, or jasmine. Crush or cut the ends of the branches a bit, submerge them in cool (not icy) water for a few hours. Then place them someplace cool in a vase of water. Wait a few days, and as the buds start swelling, bring them into a warmer spot such as a dining table or window sill where everyone can observe. Then watch them blossom and come to life! Sunday, December 4th between 12:15 and 12:45 pm. You can stay and use what you’ve learned at the 1:00 pm Latin Mass. Just a quick note to wish you a Happy Thanksgiving and let you know that Immaculate Conception will offer a low Mass at 8am on Thanksgiving Day. Also, please be aware that the normal 6:30pm Thursday Mass at St Stephen will not be offered on Thanksgiving Day. Fr David Ireland, pastor of Sacred Heart of Jesus in South Euclid, Ohio, sent in this wonderful news for you all to know. 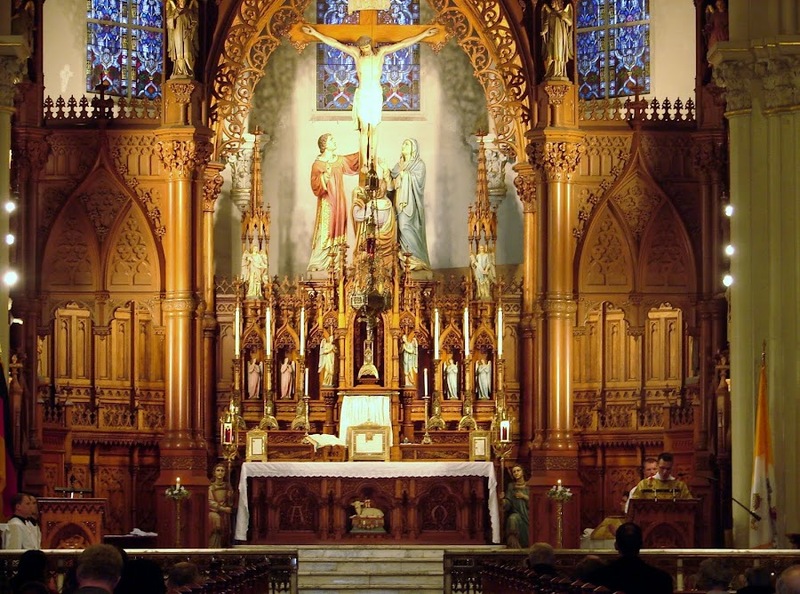 Beginning this week, Sacred Heart of Jesus in South Euclid will offer a Sung Mass in the Extraordinary Form every First Sunday of the Month at 5:00 p.m.
We have been made aware by another Friend that Sacred Heart of Jesus in South Euclid will celebrate a requiem Mass on All Souls Day at 2:30pm. The wonderful Lyceum Schola Cantorum will assist. Thanks to a friend for notifying us that there is also a 6:30pm mass for All Souls at Immaculate Conception on Nov 2. Chorbishop Anthony Spinosa, rector of Our Lady of Lebanon Basilica and National Shrine, would like for the TLM faithful to be aware of the following. Tomorrow, Oct 30, the last Sunday of October, is the traditional observation of the great feast of Christ the King. The regular Sunday schedule of Masses is there, but the beautiful annual custom which has developed over the years at St Stephen, of the German choir assisting the Latin schola, is magnificent to behold, particularly on such a glorious feast. We are reminded that this feast was instituted in 1925 by Pope Pius XI in Quas Primas. The pontiff specifically chose the last Sunday of October with an intended purpose. 28. Therefore by Our Apostolic Authority We institute the Feast of the Kingship of Our Lord Jesus Christ to be observed yearly throughout the whole world on the last Sunday of the month of October -- the Sunday, that is, which immediately precedes the Feast of All Saints. We further ordain that the dedication of mankind to the Sacred Heart of Jesus, which Our predecessor of saintly memory, Pope Pius X, commanded to be renewed yearly, be made annually on that day. This year, however, We desire that it be observed on the thirty-first day of the month on which day We Ourselves shall celebrate pontifically in honor of the kingship of Christ, and shall command that the same dedication be performed in Our presence. It seems to Us that We cannot in a more fitting manner close this Holy Year, nor better signify Our gratitude and that of the whole of the Catholic world to Christ the immortal King of ages, for the blessings showered upon Us, upon the Church, and upon the Catholic world during this holy period. 29. It is not necessary, Venerable Brethren, that We should explain to you at any length why We have decreed that this feast of the Kingship of Christ should be observed in addition to those other feasts in which his kingly dignity is already signified and celebrated. It will suffhice to remark that although in all the feasts of our Lord the material object of worship is Christ, nevertheless their formal object is something quite distinct from his royal title and dignity. We have commanded its observance on a Sunday in order that not only the clergy may perform their duty by saying Mass and reciting the Office, but that the laity too, free from their daily tasks, may in a spirit of holy joy give ample testimony of their obedience and subjection to Christ. The last Sunday of October seemed the most convenient of all for this purpose, because it is at the end of the liturgical year, and thus the feast of the Kingship of Christ sets the crowning glory upon the mysteries of the life of Christ already commemorated during the year, and, before celebrating the triumph of all the Saints, we proclaim and extol the glory of him who triumphs in all the Saints and in all the Elect. Make it your duty and your task, Venerable Brethren, to see that sermons are preached to the people in every parish to teach them the meaning and the importance of this feast, that they may so order their lives as to be worthy of faithful and obedient subjects of the Divine King. The conclusion seems obvious. The culmination of the crowning glory of Christ's earthly life and mission is proclaimed and commemorated in this feast. Before the triumph of the saints on Nov 1, we celebrate Christ's. The pontiff encourages all of us to make this day special and to order our lives to being Our Lord's faithful and obedient subjects. Furthermore, take the opportunity to pray to the Sacred Heart. The Knights of Columbus Woodlawn Council 2161 is honored to host Bishop Athanasius Schneider who will offer a Pontifical Low Mass and be the featured speaker at the Ninth Annual Battle of Lepanto Dinner on Tuesday, 18 October 2016, at St. Titus Church in Aliquippa, Pennsylvania. Don't miss this special evening. Please join us for this historic Mass & dinner. Complete details, including how to make dinner reservations, are available at the link above. Please pass this invitation to the members of your organization and anyone else who may be interested. Bishops Schneider's complete schedule of events for October is available at the link below. Masses for the feast of Our Lady's birth on Thursday, September 8, are as follow. Vouchsafe that I may praise thee, O sacred Virgin; give me strength against thine enemies, and against the enemy of the whole human race. Give me strength humbly to pray to thee. Give me strength to praise thee in prayer with all my powers, through the merits of thy most sacred nativity, which for the entire Christian world was a birth of joy, the hope and solace of its life. When thou wast born, O most holy Virgin, then was the world made light. Happy is thy stock, holy thy root, and blessed thy fruit, for thou alone as a virgin, filled with the Holy Spirit, didst merit to conceive thy God, as a virgin to bear Thy God, as a virgin to bring Him forth, and after His birth to remain a virgin. Have mercy therefore upon me a sinner, and give me aid, O Lady, so that just as thy nativity, glorious from the seed of Abraham, sprung from the tribe of Juda, illustrious from the stock of David, didst announce joy to the entire world, so may it fill me with true joy and cleanse me from every sin. O holy Mother of God, flowering as the lily, pray to thy sweet Son for me, a wretched sinner. Amen. This coming First Saturday, September 3, happens to be the feast of Pope St Pius X.
St Stephen will offer High Mass at 9:30am. Refreshments will be available in the Club Room after mass. Fr David Ireland, pastor of Sacred Heart in South Euclid, would like for you all to know the following. In response to the most recent blasphemies during a "Black Mass" conducted in Oklahoma City this past August 15, the Feast of the Assumption of Our Lady, there will be a Solemn High Mass in honor of the Immaculate Heart of Mary on Monday, August 22 at 7:00 pm at Sacred Heart of Jesus Parish, 1545 South Green Rd. South Euclid, Ohio. This Holy Mass will be offered as a special act of reparation for these most serious sins of sacrilege against the Sacred Heart Jesus and against our Blessed Mother Mary. Holy Mass will be preceded by the recitation of the Most Holy Rosary at 6:30 pm and will conclude with Benediction of the Most Blessed Sacrament. For the honor of your Mother, show your filial love for our Most Blessed Lady, and join us Monday in consoling her Immaculate Heart! Archbishop Paul Coakley of Oklahoma City has called for fervent prayers from the global Catholic community in reparation for the blasphemous acts of a "Black Mass" conducted by a organized satanist group on the Feast of the Assumption, Monday, August 15, 2016. Archbishop Coakley told the Catholic News Agency: “I am encouraging the faithful and people of good will to pray together for healing and peace, and for the Lord to watch over our community and protect us from evil and its many destructive and violent manifestations. I also ask that we pray for the conversion of these men and for all who have not yet come to know the Lord of Life. The Archbishop went on to express his disappointment in the local government for not preventing the “abhorrent act” from taking place, despite the 150,000+ signatures petitioning local authorities to intervene. Prominent American canonist and Vatican prelate Raymond Leo Cardinal Burke is among Catholic leaders who have expressed their shock and sadness about the event. His Eminence has encouraged the faithful to pray the Rosary in reparation for the event and to pray for the conversion of the perpetrators of this sacrilege. There are a number of recent subscribers whose email addresses are categorized as "unverified." This unfortunately means that you probably won't receive the email updates. So please check your inboxes and junk boxes if you recently subscribed. It should be a simple "click here" to verify and guarantee you will get the updates. Thanks to another Friend for notifying us that St Sebastian in Akron will have a TLM for the feast of the Assumption at 5pm. The CORRECT time for the Monday morning Assumption mass at Immaculate Conception is 7am. Monday, August 15 is the Feast of the Assumption. We are reminded that, though it is a day of obligation in the Church, the USCCB has abrogated the precept to attend Holy Mass because it falls on a Monday. Nonetheless, it is a solemn and great feast, and we are encouraged to practice the holy and venerable observation of Our Lady's Assumption into Heaven. Masses are listed below. Cleveland TLM Friends is happy to inform you that a true friend of the Traditional Latin Mass is being elevated in his priesthood. Msgr Anthony Spinosa, rector of Our Lady of Lebanon Shrine in North Jackson, Ohio, is being elevated in his rank in the Maronite Catholic Church. Below is the press release. Very Reverend Monsignor Anthony Salvatore Spinosa, Rector of the Basilica and National Shrine of Our Lady of Lebanon, North Jackson, Ohio to the rank of Chorbishop of the Eparchy of Our Lady of Lebanon, Los Angeles. The Divine Liturgy of ordination and elevation is scheduled for Saturday, August 13,2016 at 12:00noon. Thursday, May 26, is the traditional observation of the solemn feast of Corpus Christi this year. St Stephen's will offer a Solemn High Mass with procession at 6:30pm. Anyone interested may bring flowers to adorn the altar. Some exciting news from a Friend of the TLM -- Msgr Anthony Spinosa, rector of the National Shrine of Our Lady of Lebanon, would like for you all to know about this. Just a friendly reminder to consider practicing the traditional devotions of First Friday and First Saturday. The traditional observation of Our Lord's Ascension into Heaven is tomorrow, Thursday May 5. Though it is not a day of obligation here in Cleveland, it is still a pious act of devotion to hear Mass on this day. And we are blessed to have Latin Masses available. A Friend of the TLM sent in the following, reminding all of us to try and keep these days of pious devotion. There are many things going on this weekend, with it being both first Friday/Saturday + Divine Mercy Sunday. "O Death, where is your sting? O Hell, where is your victory? Christ is risen, and you are overthrown. Christ is risen, and the demons are fallen. Christ is risen, and the angels rejoice. Christ is risen, and life reigns. Christ is risen, and not one dead remains in the grave. For Christ, being risen from the dead, is become the first fruits of those who have fallen asleep. To Him be glory and dominion unto ages of ages." And the governor answering, said to them: Whether will you of the two to be released unto you? But they said, Barabbas. Pilate saith to them: What shall I do then with Jesus that is called Christ? They say all: Let him be crucified. An interesting point to be made here is that the name Barabbas means son of the father (bar - son, abba - father). Barabbas is the notorious prisoner, a murderer and rioter. He is known to be guilty. Pope Benedict XVI in his book, Jesus of Nazareth, translates the word for those who called for the guilty son of the father to be released, thereby sentencing the Innocent Son of the Father to death, as crowd. We sentence Jesus to death every time we choose evil. The School of Jesus Crucified presents the following meditation and reading for our benefit. The School of Jesus Crucified can be found online, for free, here. rash presumption, and weep over your sin. that multitude who will ask for His liberation ! be put to death, that He should be crucified. your deeds: — " Let sin triumph but let Jesus die! ! God, and displease not so good a God anymore. your firm determination of serving God alone. deavour to crucify them by mortification. bitterest torments and most ignominious death. Cleveland TLM faithful have the daily opportunity to attend liturgical services in anticipation of Our Lord's Resurrection on Easter Sunday. Holy Week is packed with daily Masses, the Office of Shadows, and the full Triduum, culminating in the glorious Easter Vigil. Immaculate Conception in Cleveland is making the Friday's of Lent a good place for Traditional Catholics to observe pious practices and devotions. The evening begins with confessions before a 6pm Latin mass. Stations and Benediction will follow. The Ash Wednesday schedule of masses is below. We are reminded that it's a day of fast and abstinence. Also, though it is not a day of obligatory mass attendance, it's certainly a day of beauty and eternal truth concerning our mortality, and Catholics are encouraged to assist at Holy Mass. Remember, man, you are dust; and unto dust you shall return. Blaise, who had studied philosophy in his youth, was a doctor in Sebaste in Armenia, the city of his birth, who exercised his art with miraculous ability, good-will, and piety. When the bishop of the city died, he was chosen to succeed him, with the acclamation of all the people. His holiness was manifest through many miracles: from all around, people came to him to find cures for their spirit and their body; even wild animals came in herds to receive his blessing. 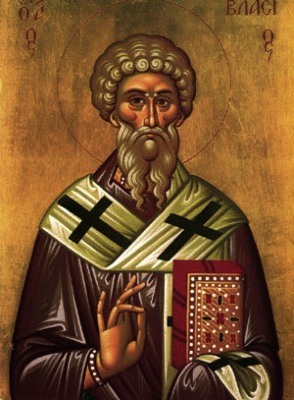 In 316, Agricola, the governor of Cappadocia and of Lesser Armenia, having arrived in Sebastia at the order of the emperor Licinius to kill the Christians, arrested the bishop. As he was being led to jail, a mother set her only son, choking to death of a fish-bone, at his feet, and the child was cured straight away. Regardless, the governor, unable to make Blaise renounce his faith, beat him with a stick, ripped his flesh with iron combs, and beheaded him. The Blessing of Throats will follow both Masses. Please kindly accept our apologies. Incorrect information was given to us regarding the Candlemas mass time at St Stephen. Please pay attention to the following, and if you informed anyone previously, send along this correction. St Stephen's will celebrate Candlemas on Tuesday, Feb 2 at 6:45 AM. The blessing and procession will take place before mass. Again, the mass for Candlemas at St Stephen is a morning mass, not an evening mass. 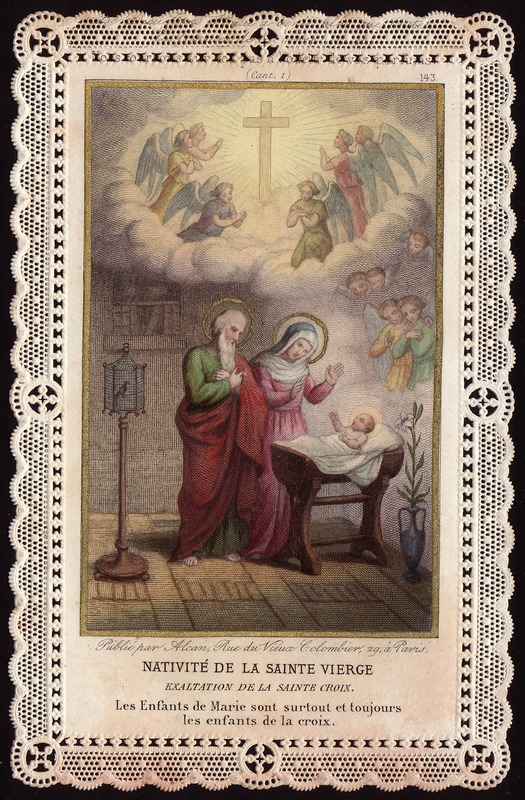 Candlemas, the Feast of the Presentation of Our Lord and Purification of the BVM, is Tuesday Feb 2. The Latin Masses are listed below. Forty days after the birth of Christ Mary complied with this precept of the law, she redeemed her first-born from the temple (Numbers 18:15), and was purified by the prayer of Simeon the just, in the presence of Anna the prophetess (Luke 2:22 sqq.). No doubt this event, the first solemn introduction of Christ into the house of God, was in the earliest times celebrated in the Church of Jerusalem. We find it attested for the first half of the fourth century by the pilgrim of Bordeaux, Egeria or Silvia. The day (14 February) was solemnly kept by a procession to the Constantinian basilica of the Resurrection, a homily on Luke 2:22 sqq., and the Holy Sacrifice. But the feast then had no proper name; it was simply called the fortieth day after Epiphany. This latter circumstance proves that in Jerusalem Epiphany was then the feast of Christ's birth. Incidentally, it is made clear again the importance and solemnity with which the Feast of the Epiphany was kept in times past. The solemn procession represents the entry of Christ, who is the Light of the World, into the Temple of Jerusalem. It forms an essential part of the liturgical services of the day, and must be held in every parochial church where the required ministers can be had. The procession is always kept on 2 February even when the office and Mass of the feast is transferred to 3 February. Before the reform of the Latin liturgy by St. Pius V (1568), in the churches north and west of the Alps this ceremony was more solemn. After the fifth oration a preface was sung. The "Adorna" was preceded by the antiphon "Ave Maria". While now the procession is held inside the church, during the Middle Ages the clergy left the church and visited the cemetery surrounding it. Upon the return of the procession a priest, carrying an image of the Holy Child, met it at the door and entered the church with the clergy, who sang the canticle of Zachary, "Benedictus Dominus Deus Israel". At the conclusion, entering the sanctuary, the choir sang the responsory, "Gaude Maria Virgo" or the prose, "Inviolata" or some other antiphon in honour of the Blessed Virgin. Masses for the Feast of the Epiphany, on Wednesday, Jan 6, are listed below.